The end of the month means my favorite post...Empties! I love to read reviews and watch these videos on Youtube. I will be keeping track of how much money I use up in empties again this year. I am also keeping track of purchases and my $25 budget. I'll update all of that at the end of the post. Loreal Total Repair 5 conditioner - I have used a few of these samples and I really like this line of products. I don't need shampoo or conditioner anytime soon but I'd purchase this one. Acure repairing conditioner - This was okay but I didn't notice anything great with my hair to want to purchase it. 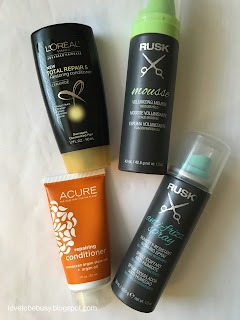 Rusk anti-frizz spray - This was too sticky for me. I'll pass. Rusk mousse - I am not a fan of mousse I guess. This gave my hair texture but it is already very thick and I don't need to add volume. I ended up using this on wet hair when I knew I was going to air dry and put it in a ponytail the next day. 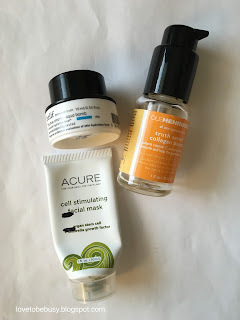 Acure cell stimulating facial mask - I really liked this mask. My skin felt very soft after using it, however, I didn't really see a huge difference in how my skin looked. It was a bit weird to take off since it foamed up as you rinsed it. I'd consider purchasing the product after I finish some other masks though and see if I notice a difference with more uses. Belif the true cream aqua bomb - This was a 100 point perk from Sephora that I picked up because I really liked the sample packet I tried. I really love this moisturizer for my oily skin. I have some other gel moisturizers to use up but I'd purchase this one again. Ole Henriksen truth serum collagen booster - I love this stuff but it is pricey! I am trying out some other serums that are similar right now to see if I find one I prefer that might be less expensive. I'll go back to this one if I don't find anything I like as well. This does last me about six months with using it in the mornings so it is probably worth the price. Sephora triple action cleansing water - This is my holy grail cleansing water. I use it every night to take off my makeup and it does a great job and doesn't sting my eyes. I use this as my first step and then I use a cleanser. I will repurchase. 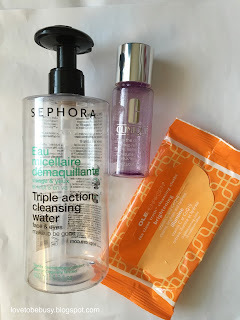 Clinique take the day off makeup remover - I hated this. I'm glad I just bought the travel size. It left a residue and I didn't feel like it removed eye makeup as well as others I have tried. Ole Henriksen the clean truth cleansing clothes brightening - I didn't like these either. They weren't saturated enough to remove makeup and had a weird smell. 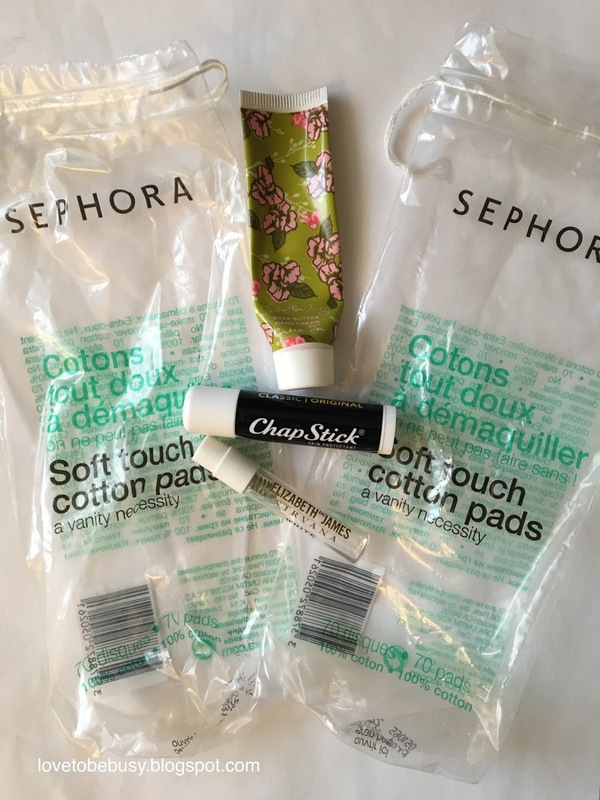 Sephora soft touch cotton pads - These are my absolute favorite. I'll add them to an online order or buy a bunch when I have a coupon code. I keep them in a jar in my bathroom that I refill so I don't always go through all of them each month, it just means I have refilled my jar. Chapstick - I have a bunch of these sitting around still that I am trying to finish up. They are fine but not super moisturizing. I'll look for a better replacement when they are gone. Elizabeth and James Nirvana White perfume - I don't understand the hype around this fragrance. It was okay but definitely not something I need to purchase. Rimmel Stay Matte powder - I really liked this powder. I just had a bit around the edges when it got knocked off the counter and shattered on the floor. I was able to use up most of the product though before it happened. I am trying to use up a few other powders before I consider repurchasing this one. Tarte multipleye prime - This came in a Tarte holiday calendar of minis and I'm pretty sure this exact product is discontinued now. They have another primer I might try although I don't feel like I need one with most mascaras to get a nice everyday look. Laura Gellar glamlash dramatic volumizing mascara - This didn't do much for my lashes on its own. However, when I used it with the Tarte primer, it was fantastic and my lashes looked long and thick. I'm not sure I want to spend the money on two products to get the effect I want when I can get it with one mascara I really like. 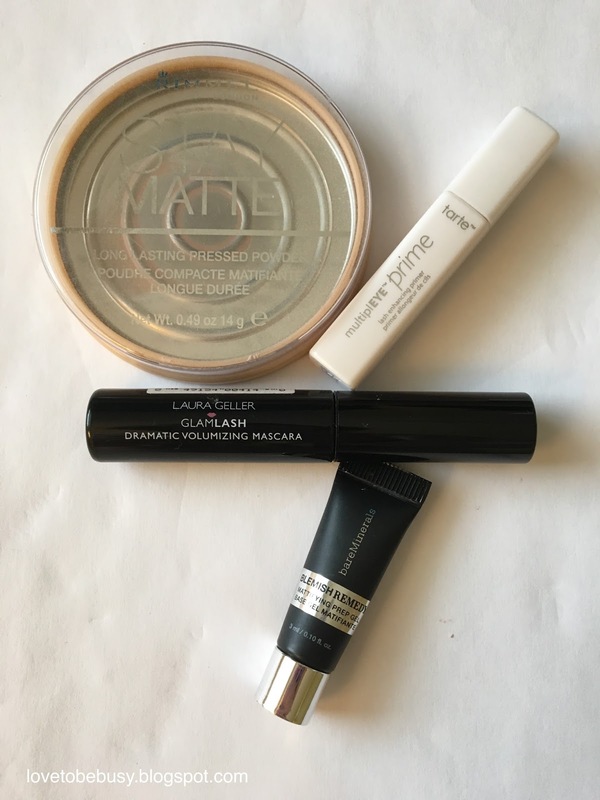 Bare Minerals blemish ready mattifying prep gel - This was a good primer. It wasn't a silicone primer but more like a lotion, which I prefer. I did not get really oily when I used this and I think it did a good job of mattifying most spots on my face. I'd recommend it but I don't need a primer anytime soon. I took in 21 products plus 6 nail polishes. I spent $15 of my $25 budget this month on 4 Zoya nail polishes. Although I don't have a ton of nail polishes, these weren't a necessity so I am taking them out of the budget. I will have $10 roll over to next month. What did you use up that you loved or hated?